The GREAT BLUE HOLE is a large underwater sinkhole off the coast of BELIZE. It is indeed an awe-inspiring natural phenomenon. The first person to explore the Great Blue Hole was JACQUESCOUSTEAU, with the help of his research ship the “CALYPSO”he investigated the depth of the sinkhole in 1972.It lies near the center of Light House Reef. It is the world’s largest natural formation of its kind. This is not only the most unique area in the world but is also the only Blue Hole seen from the space. This is situated in a cave that was formed above sea level. It is circular in shape around 300mts across and 125 mts deep .Blue Hole has an incredible ecosystem and vast caves. It is a world heritage site of the UnitedNations Educational Scientific and Cultural Organization. This expedition led by COUSTEAU ranked the Great Blue Hole among the top ten scuba diving locations in the world. It is among the best dive sites in the Caribbean because of the crystal clear waters and world class destinations for recreational scuba divers. Many people travel to Belize because they love to scuba dive and want to explore the bountiful underwater caves. It is a great recommendation for anyone who loves underwater exploration. 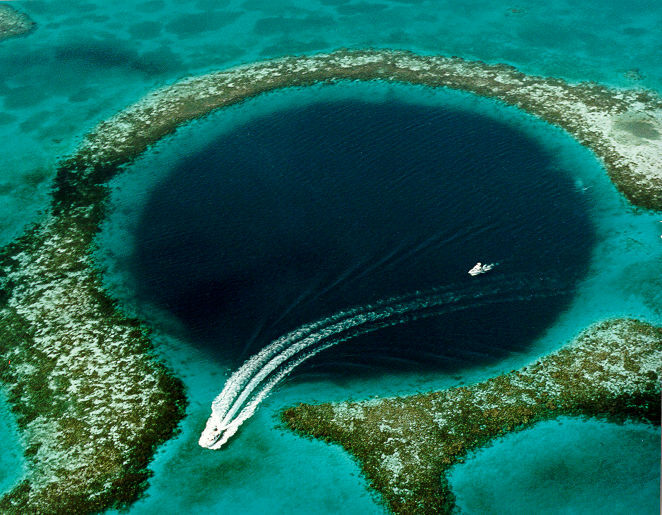 The GREAT BLUE HOLE should be used by the experienced scuba divers if the aim is go deeper into it.Diving into the depths require advanced diving skills and specialized equipment,another reasons why diving into deep is recommended only for experts is that the wall of the hole slopes backwards at the base and maneuvers may prove difficult for the less experienced. The touring guide takes a Dive excursiontour to the Great Blue Hole for full-day. The trips usually consist of one dive in the Blue Hole and two extra dives in nearby reefs. There are navigational markers installed to guide mariners to BLUE HOLE. There are almost 11 underwater caves. The different colours of blue surrounding the Great Blue Hole are a gorgeous sight. Right from the shallow Pale Blue Green to almost purple water of the deepest part. The corals and many varieties of fish are the added bonus to this trip. The corals around the Blue Hole break the surface in many sections at low tide. There are 500 different species of plants and animals that are seen in this place. The marine life is the attractions of the Great Blue Hole .The marine life in these areas includes sharks, giant groupers, and many types of Caribbean reef sharks and blacktip sharks. It’s really fun experiencing the marine life while diving along with the fishes. From above watch the stunning natural beauty of Belize GREAT BLUE HOLE in a unique form. You can have an aerial view of the Turneffe Atoll, The Great Barrier Reef. Do not miss out to see the turquoise sea turns a deep navy at the majestic blue hole. It’s totally worth flying over the Blue Hole for a breath-taking view. Some believe that this place should be one of the SEVEN WONDERS OF THE WORLD.